Vision loss occurs from a variety of causes. Some conditions are medical. Examples are macular degeneration, diabetic retinopathy, cataracts, and glaucoma. Some conditions are genetic. Examples include Stargardt’s Disease, Retinitis Pigmentosa, and albinism. Other causes can be congenital or traumatic. A low vision examination is quite different from a regular eye examination. It is a longer examination usually lasting one hour or more. It is a “vision and function” examination; therefore medical tests such as dilation are usually omitted. The first part of the low vision examination is conversing with the patient to find out how the reduced vision is affecting their life. The “wish list” is created so Dr. Pino understands what the patients’ goals are. The second part is extensive vision testing. Careful refraction is performed to find out if a new “regular” eyeglass prescription will help. Part three works with magnification, illumination and other optical and non-optical low vision devices. The doctor must determine the best form and level of magnification needed for the person to perform the desired tasks. Telescopes, microscopes, and prisms, with varying levels of magnification and strength as well as other magnification devices are presented to the patient. Illumination levels must be determined as lighting plays a major role in vision. Part four is another conversation with the patient to determine the best form and level of magnification for that particular person’s task requirements. 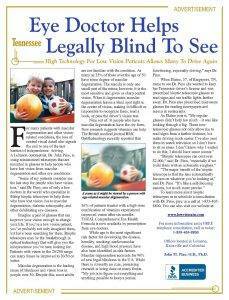 Low Vision doctors have been trained in the physics, optics and use of high-powered lenses and lens systems. They understand the principles of magnification, field of view, depth and of focus. They also have a working knowledge of the advantages and disadvantages of the multitude of low vision glasses, magnifiers, electronic and non-optical devices available. A low vision eye doctor understands how to work with patients and families who can be extremely upset, fearful, and even depressed. It’s a doctor who has the patience and time to explain the eye and vision condition and what the future may hold for patients who may be confused, misinformed and/or have an unrealistic view of their future. A low vision eye doctor has compassion and empathy for what the patient and family is going through as well as the knowledge, resources and experience to help them adjust to the difficult situation. Low Vision doctors know how to analyze a task according to the amount of vision, lighting, working distance and field of view needed for completion. They are expert as designing low vision glasses to meet the needs of the patient. Low Vision devices are considered to be “task specific”. The glasses are designed to complete the task desired. From time to time it is possible to design a pair of glasses for multiple tasks. Often this is not possible. It usually takes two to four weeks for specialized glasses to be fabricated. Arrangements can be made to have them sooner in some circumstances. If a person has a special event happening and needs the glasses, the lab can usually expedite the order. The free telephone interview is a way of limiting the time, expense and disappointment of people who probably cannot be helped by low vision care. Dr. Pino has determined that asking the right questions on the phone could determine if a patient was qualified for low vision services. “If not, why put the patient through the time and expense only to be extremely disappointed?” says Dr. Pino. During the free telephone interview, Dr. Pino will ask questions regarding vision, functional abilities, goals, motivation, health, and mobility to determine if an appointment is in the best interests of the caller. During the evaluation, the patient will use actual low vision telescope, microscope and prismatic glasses on the tasks desired. Dr. Pino and the patient will see that they work BEFORE they are ordered. This will be done again when the patient picks up the glasses. We never order glasses until the patient knows that they work.